The title of Mick Herron's Reconstruction initially is a bit of metafiction: the narrator inserts himself briefly to announce that the text is a post-incident reconstruction of events leading up to a hostage situation in a nursery school in Oxford. 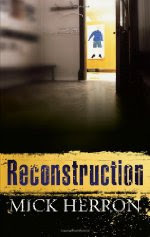 But there are many other levels of reconstruction, of the past and of a particular nation, that resonate in the title. As with the more recent Slow Horses, the security service is involved (this time MI6 instead of MI5, and there are lots of twists and turns--though not quite as abrupt and not quite as much fun as the about-faces in Slow Horses. A young man with a Spanish name and a gun appears in a nursery just as it is about to open: only one parent, his twins, one teacher, and a cleaning woman are present, and the teacher heroically shuts down the school and chases away the arriving parents and children, then goes back into the school, in a heroic gesture (possibly) or from a sense of responsibility to her students still inside. Herron does a good job of keeping this claustrophobic situation tense and lively, with just enough action among the police and security service outside the school to broaden out the story. For my taste, though, the close focus on the schoolroom got to be a bit too much and it was a relief when finally the hostage situation ends, and the novel shifts for the final twists, having to do with both who the criminals are and who finds him or herself actually at the center of things (rather than egotistically imagining that they are at the center of things, one of the major themes of the book). The book is tight and enjoyable, but I think Slow Horses is better, tighter, twistier, and funnier. But on the basis of both books, I'm trying to get hold of Herron's earlier detective series, which promises something of the same pleasures but also something different.